*sigh* Demon is a ferocious dog that all pillows should fear... that and shoes. He is literally a 'demon' when it comes to his obsession with tearing into my best pillows; oddly enough he only rips into them when there's no pillow cover. He also has a shoe fetish, not only for gnawing but to carry around and stick his nose inside when he lays down. He's one big ball of energy and could chase a ball 24/7. 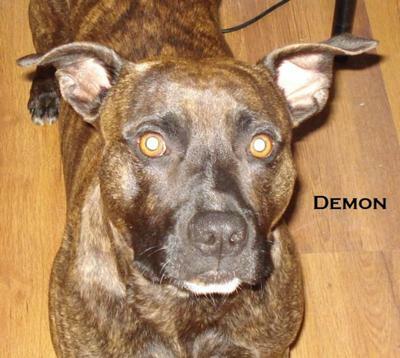 Demon is a Divo dog who just has to have fresh water in a dish, blankets on the floor to rest, he hates to be ignored, he'll whine for a petting, nudge you with his nose for a rub down, and he'll turn up his nose if his food isn't to his standards. While Pillows and Shoes should fear him (rightly so) Demon is the most affectionate, tongue hanging, drooly, doggie I know. He may bark at skate boards and bicycles but with a few sniffs in to meeting you you're like his new best friend he wants to play with.